Earn 449 loyalty points when you order this item. 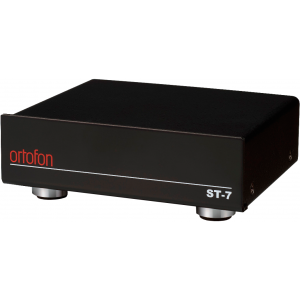 Ortofon's ST-7 transformer is a perfect match for the MC Quintet Series and the SPU Classic models among other MC cartridges. Compact and stylish, the ST-7 has a solid housing supported by four rubber feet, which helps to reduce unwanted vibrations in the unit. High quality internal wires together with high quality gold plated terminals provide the optimum signal transmission. The sandwich winding structure, used in the ST-7, significantly improves the high frequency response and provides a very clear and open sound over the whole frequency range. Additionally, the dual-mono design, including the individual shielding of the two channels, improves the imaging of the transformer and reduces the influence of environmental noise.